The sequence for general transmission line construction is described below. Please see the Gateway West Project schedule for information regarding projected construction and completion. The video illustrates the construction of a 500 kV line using galvanized steel structures. Access roads are built throughout the corridor to construct the transmission line and conduct maintenance during the life of the line. In order to accommodate large equipment and materials during construction, access roads must be 14 feet wide. Construction staging areas and substation sites are constructed and also require access. Erosion, both during and after construction, is minimized with the installation of water bars, culverts and sediment basins. Foundations are installed at each tower site. Typical foundations are made of steel reinforced concrete piers and are generally four feet in diameter and 15 feet deep, though these numbers may vary dependent on the soil or rock type at each site. Reinforced steel anchor bolt cages are installed after excavation and before concrete placement to strengthen the foundation’s structural integrity. Each foundation extends about two feet above the ground. Components for each structure are delivered by flatbed truck and assembled on site by a truck-mounted crane. The structures are then lifted onto the foundation using a large crane specifically designed for tower construction. The crane moves along the right of way to set each structure in place. In some locations, it is necessary to set structures using a helicopter (see photo). Every three miles along the right of way, temporary five-acre work sites are set up for the equipment used to pull and tighten the wires or conductor. The initial stringing begins with a helicopter pulling a lighter weight sock line through sheaves attached to each tower. A specialized wire-stringing vehicle is attached to the line to pull it through, followed by tightening or tensioning the line to achieve the correct sagging of the line between support structures. Disturbed areas around the structures are restored and re-vegetated, as required by the property owner or land management agency. All practical means are used to return land to its original contour and natural drainage patterns along the right of way. 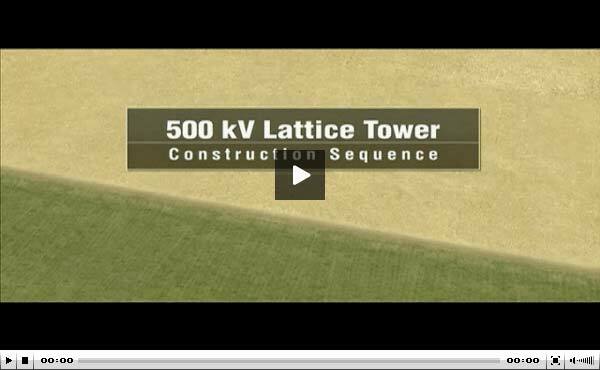 Want to view more transmission line construction videos? There are a number of informational videos online, produced by various other companies, showing transmission line construction, including placement of towers. Please note the Companies did not contribute to the content or development of any of these videos. While these videos provide good general information, the Companies do not endorse any opinion, recommendation or advice expressed in these videos.